Police in California are searching for a woman who was caught on surveillance video ripping down a “thin blue line” flag meant to support law enforcement. The unidentified woman was spotted on the 2400 block of Santa Clara Avenue on March 26, according to a Facebook post from the Alameda Police Department. Video footage showed the woman donning a yellow sweater or sweatshirt as she walked down a sidewalk with someone. The two passed a “thin blue line” flag posted outside a storefront when the woman jumped up to grab it and tried to pull it to the ground. Before the flag hit the ground it appeared to hit her in the head. The woman then dragged the flag and tossed it on the ground nearby. The “thin blue line” flag that was displayed is a flag designed to show support of police and other law enforcement agencies. It’s a black and white American flag with a blue line that replaces one of the 13 stripes. 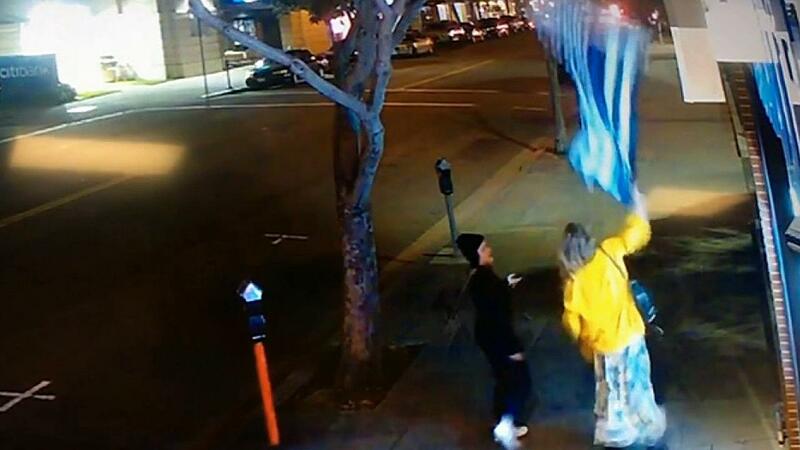 Those with information that can help identify the woman are asked to contact the Alameda Police Department at 510-337-8340 and refer to case No.19-01667. Previous articleUS Congressman from California Eric Swallowswell wants to be YOUR President. Just another scheme to raise cash and publicity.